Given Mat Maneri's eminence as a viola player plus the enviable breadth and depth of his discography, it seems remarkable that he has not released an album as a leader since 2005's Pentagon on Thirsty Ear. In the intervening years, he has forged links with saxophonist extraordinaire Evan Parker and with the renowned Romanian-born pianist/composer/arranger Lucian Ban, leading to this album. 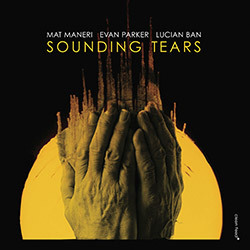 In 2009 Maneri and Ban met and bonded during the recording of Enesco Re-imagined, an album dedicated to the great Romanian composer of its title; by June 2011 the pair were recording their first duo album, Transylvanian Concert, which was released by ECM in 2013. Meanwhile, in July 2011, Maneri played at Parker's Unwhitstable festival in the saxophonist's favourite recording location, St. Peter's church, Whitstable, where he played in a quartet with Parker. In May 2012, Maneri and Ban joined Parker in a trio at his regular monthly gig at London's Vortex club. Such shared history meant that when the three came together in New Jersey's Tedesco Studios, in September 2014, to record Sounding Tears they knew each other's playing well. Of the album's ten tracks, totalling fifty-one minutes, all but two were improvised in the studio. The exceptions are Maneri's piece "Blessed" and Ban's "Hymn" (despite those titles, there is no religious theme running through the album). The former, the album's longest track at seven-and-three-quarter minutes, is taken at a measured, stately pace dictated by the piano and viola, with Parker subtly introducing saxophone phrases that are totally compatible with the subdued ambience; altogether, a beautiful and enchanting track which, over time, may come to be regarded as the album's highlight. Remarkably, Ban's composition manages to create a similar relaxed, laid-back feel to that of Maneri's; with piano and saxophone to the fore, and Maneri in a supporting role, the three unhurriedly create a small gem that radiates a sense of calm. The eight improvised tracks share many of the positive attributes of those compositions. Although it is a well-worn clich�, heard together it would be difficult, if not impossible, to distinguish the composed tracks from the improvised ones. Key to that is the patient, unhurried way in which the three players interact, allowing one another time and space to search and explore without pressure. The resulting music reflects that, without a single note sounding rushed or ill-considered, and no-one putting their contribution before the totality of the music. End result: after ten-or-so hearings, Sounding Tears is already on the best-of-2017 list. Unmissable.